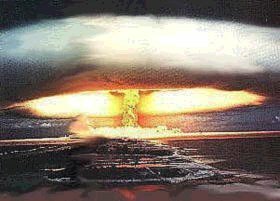 more on Tunguska ... a 40 megaton atom bomb in 1908? On http://nexusmagazine.com/articles/installation2.html -they put forward a theory that someone - a long time ago, constructed an ancient underground technical installation - an artificial complex that then in 1908 - and still today is protecting the Earth from meteorites and asteroids. 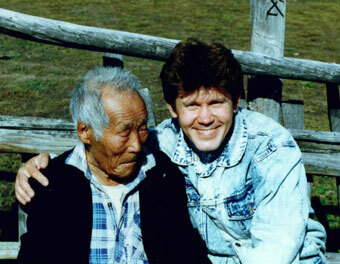 photographed with the author Valery Uvarov - of the nexus article with the theories above - at the Evenk settlement of Siuldiukar in 1997. HOWEVER - IF WHAT the DAL/pleiadian contactperson "Asket" told Meier(first part)- that this was the last desperate act or a kind "collective suicide because all onboard was infeced of a death-disease got on earth" - of an ET-group with a ship not capable of leaving Earth. Yes - if this is correct -it is likely that they had probes/lesser ships that may have been the other flying crafts observed before the mainexplosion occured. JUST BEFORE THE EXPLOSION..there were several objects moving in the sky above the Siberian taiga, approaching the explosion site from different sides. It was the discrepancies in the accounts of eyewitnesses—who at one and the same time observed objects above areas of Siberia far remote from one another, moving on different courses but towards a single point—that confused researchers, prompting the hypothesis that it was probably a spaceship that had been manoeuvring above the Siberian taiga. One witness to these events was next to a small lake when the ground started to shake beneath his feet. Something like an earthquake began. Suddenly, down inside him, an inexplicable, inhuman sense of fear arose. It was as if some force was driving him away from the lake. At that moment, the water in the lake began to drop down, and as it flowed away, as if into a crack, the bottom appeared which was shifting apart like two leaves. Indentations could be seen on the edges of the two gigantic leaves. The witness was seized by an impulsive animal terror and fled as fast as his legs could carry him. On 30 June an unusual phenomenon was observed to the northwest of Kirensk that lasted roughly from 7.15 to 8 am. I did not see it myself, as I sat down to work after recording the reading of the meteorological instruments. This is what occurred (I give the gist of what those who witnessed it said). At 7.15 am, a fiery pillar appeared to the northwest, about four sagens [over 8 metres] in diameter in the shape of a spear. When the pillar disappeared, five strong brief bangs were heard, like cannon shots following quickly and distinctly one after another. Then a dense cloud appeared at that place. Many people saw the pillar of fire, but the bangs were heard by an even greater number. There were peasants in town from the village of Korelinaya that lies 20 versts [21 km] from Kirensk on the nearest Tunguska. They reported that they had had a powerful earth tremor such that window panes were broken in the houses…the mark on the barograph roll bears this out. In the archives of the former Irkutsk Magnetic and Meteorological Observatory, investigators managed to find notes written by A. K. Kokorin, who was an observer at a weather station on the River Kezhma, about 600 km from the Tunguska explosion site. In his observation journal for June 1908, the section headed "Notes" contains an exceptionally important entry. It shows that there was certainly more than one body in the air at that time. At 7 am, two fiery circles [spheres] of gigantic size appeared to the north; 4 minutes after appearing, the circles disappeared; soon after the disappearance of the fiery circles a loud noise was heard, similar to the sound of the wind, that went from north to south; the noise lasted about 5 minutes; then followed sounds and thundering, like shots from enormous guns, that made the windows rattle. Those shots continued for 2 minutes, and after them came a crack like a rifle-shot. These last sounds lasted 2 minutes. Everything took place in broad daylight. At that time, T. Naumenko was observing the flight of a sphere from the village of Kezhma which stands on the River Angara. He asserted that the body was larger than the Moon and crossed in front of the Sun, which at that time was at a height of 27º above the horizon. At that same moment, the Tunguska meteorite flew over the village of Mironovo (58º 14' N, 109º 29' E). The first to see the flight of one of the "terminators"(thus may be lesser scoutships they used in the operation-before the "collective suicide"-rø-remark) - carrying a powerful electromagnetic charge - were the inhabitants of the village of Alexandrovka (southern Altai territory), which is almost 1,500 kilometres away from the site of the explosion. ...30 June 1908 was a clear day… I was sitting opposite a window looking NW. Our village, Alexandrovka, extended along a gorge… Across from the village on the Semi ridge rose the peak of Mount Gliaden. At 7 in the morning, the Sun had already risen but not yet appeared from behind Gliaden. With the start of the noise a sort of glow appeared in the air, round in shape, about half the size of the Moon, with a bluish tinge, flying rapidly in a direction from Filimonovo towards Irkutsk. The glow left a trail in the form of a pale bluish stripe that extended almost the full length of its course, then gradually vanished from the end. The glow hid itself behind the mountain without breaking up. I was unable to note the duration of the phenomenon, but it was very short. The weather was absolutely clear and it was still. At that same time, the flight of a heavenly body was observed in the south of the Krasnoyarsk territory, 60 km north of Minusinsk, 930 km from the site of the explosion, but moving along a different trajectory. Roughly at the same time, an object was seen in the region of the Nizhneye-Ilimskoye settlement, 418 km from the explosion site. And then, it has been reliably established, a heavenly body flew over the village of Preobrazhenka, which is on the Nizhniaya (Lower) Tunguska River. And all these objects were flying in the same direction—towards one destination: the Shishkov and Kulik blast areas and Voronov's crater! The picture that forms from eyewitness accounts clearly shows that the objects observed from various parts of the taiga could not have been meteorites. There were many of them and they followed different trajectories, but towards a single point. Amazingly, the scientists and researchers who so carefully questioned numerous witnesses were unable to spot in their accounts any difference between the behaviour of the meteorite and that of the "terminator spheres" that closed in large numbers from different directions in order to destroy it. It is a well known fact that the flight of a meteorite through the atmosphere is always very short (a matter of seconds) and very fast (between 6 and 22 km per second), at an angle to the Earth's surface along a straight trajectory, leaving a trail of fire and smoke that extends for 200 to 300 km and takes some tens of minutes to disperse. The reports of researchers and explanations of scientists speak of a single Tunguska object. Yet the eyewitness accounts of the event itself and the evidence gathered by researchers stubbornly indicate that there were several objects in the sky, following different trajectories from different directions, but most significantly moving slowly, parallel to the Earth's surface, sometimes stopping, changing course and speed—in other words, manoeuvring—which entirely excludes the suggestion that the objects seen were comets or meteorites. Meteorites and comets do not fly like that! Thousands of observers could not have mistaken what they saw, as the sky was cloudless that morning. People living within a radius of over 800 km from the place where the cosmic intruder fell observed the unusual flight of enormous fiery bodies giving off sparks and leaving rainbow trails behind them. The most important point, though, is that they did not all see one and the same object, but different "terminator spheres" that varied in appearance and behaviour. Below is an extract from the account of a witness who lived in the village of Moga on the Nizhniaya Tunguska, 300 km east of the site of the explosion. It was quoted in Yury Sbitnev's book Echo and speaks for itself. …I remember that time well—I was eleven then. I got up quite early… It was clear and cloudless… Our house was here, where it still stands, on a hill. I was hammering the scythe. The house stood, like the majority of Russian houses on the northern rivers, with its windows looking east and south. One little window faced northwest and this "sun" was shining through it, colouring the white wall of the big Russian stove crimson. This glow moved from right to left, towards the east. And there was ordinary sunlight coming through the other windows and onto the other wall of the stove. The fiery sphere that appeared in a clear, cloudless sky approached the earth with a growing rumble. It grew as you watched, blazed and became so full of powerful fiery light that it was impossible to look at it. At some elusive instant, the terrible rumbling turned into an incessant roar and the sphere stopped moving, hanging above the ground, like the Sun hangs above the horizon just before sunset. It is hard to establish the length of time it stopped, but the fiery sphere stayed motionless long enough for its immobility to impress itself upon an astounded human mind. I was afraid to look out of the window, but on the stove I could see that it had stopped. Then suddenly it gave such a burst of speed, flashed across the stove and was gone. The thundering noise was awful. The earth shook. I was knocked to the floor and the glass from the little window was scattered about as if someone had pushed it in… I wasn't down on the floor for long. I jumped up, thinking, "Where's Grandpa? Don't say he's been knocked off!" He was lying on his stomach on the very edge of the stove and kept asking me, "Stiopa, what is it? Stiopa, what is it?" He was wet and white, white… I think the ground was still shaking, the floor shifted under my feet, or perhaps my legs were trembling. It was dreadful! Judging by the details of this account, the narrator was very close to a place where a "terminator sphere" had been generated; in other words, in the immediate proximity of one of the pillars of energy (fiery whirlwinds) delivering the "terminator" to the surface. Someone saw a fiery pillar as well going down from that fireball, and for an instant there appeared a sort of huge tree with a round, fiery crown. Someone noticed that this raging bundle of light spat out, as it were, one more ball that tore earthwards. Others, though, insisted there had been no second ball, but that blaze, that sun, itself hurled itself down slantwise. extract from http://nexusmagazine.com/articles/installation2.html -but the author there have another theory- that it indeed WAS a meteorite coming - but a far, past, ancient civilisation - may be many, many thousands of years ago - had made an artificial shield against such dangers - and such protecting earth. But I myself - have in my search found so much confirmations on the Semjase-material from many sources - (ex.as I have also gathered in my book on the case) -that I draw the conclusion that IT WAS IN FACT A ET-SHIP EXPLODING as Asket said. BUT thanks so much to Valery Mikhailovich Uvarov - head of the Department of UFO Research - for his VERY good article in nexusmagazine !! !